Your local account manager representing K’(Prime) Technologies is Shaelen Konschuh. Please feel free to utilize Shaelen for all of your Agilent genomics-related needs. For your convenience, we have included a brief overview of our portfolio below. Agilent has a large support team. 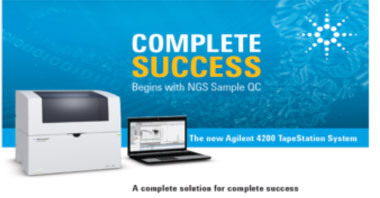 If you require assistance trouble-shooting or developing new applications, or are simply curious about Agilent genomics solutions that could complement your workflow, do not hesitate to contact Shaelen. Recently there have been several exciting new additions to Agilent’s portfolio of genomic solutions. Check out the latest news and follow the header links below for more information. Introducing the NEW 4200 TapeStation System! THE BRAND NEW 4200 TapeStation features seamless scalability from 1 to 96 samples at a constant cost/sample, fully automated 6 processing and complete walk-away operation for all 96 samples in less than 90 minutes! MAXIMIZE your throughput like never before while retaining superior accuracy, sensitivity, and flexibility. Available for orders today – contact Shaelen for more information. The AriaMx RT-PCR System – Introductory Promos still running! The AriaMx Real-Time PCR System is ready to go, with no need to calibrate. It is optimized for Agilent’s Ultra-fast Brilliant III master mix, but also works with other fast chemistries, and features blazingly quick scan times. With its modular design, configurable and customer-changeable optics, the AriaMx rapidly adapts to your changing needs while supporting a broad range of applications, including gene expression, genotyping, allele discrimination, NGS library quantification, and more. The AriaMx accurately quantifies across 10 orders of magnitude with superior thermal control and supports both single- and multi-plexing. The instrument has been robustly validated across 100,000 samples and 14 different chemistries and assays. Contact Shaelen to learn more about the exciting introductory promo offers on the AriaMx system and Brilliant III qPCR reagents! Bring the synthetic biology revolution into your laboratory! A special 30% introductory discount is still being offered on SureVector kits until August 24th only! SureVector allows you to rapidly, flexibly, and reliably generate custom vectors in your own lab as your needs and applications evolve, saving you time and money otherwise wasted on re-ordering catalog vectors or composing homebrew assemblies. Order the SureVector Core Kit today and mix-and-match components for a possible 216 individual vectors. Over 700,000 constructs are possible with the addition of components from the expansion kit! For a limited time only, we would like to thank you for learning more about our Genomics portfolio by attending Genomics e-seminars or in-person seminars and offer a 25% discount on select purchases to attendees. Don’t miss GeneWake CEO Dr. Robert Loewe’s e-seminar One Cycle Ahead to take advantage of this opportunity and learn more about optimizing your qPCR applications. AriaMx – Buy the AriaMx RT-PCR System and get 30% off the instrument, 40% off reagents. SureVector – Buy SureVector kits and get 30% off. Attend an Agilent Genomics e-seminar or in-person seminar and receive a 25% discount off select purchases. Contact Shaelen for more information!